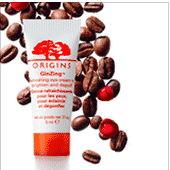 Here’s a nice freebie if you happen to have an Origins nearby. Click here to visit their facebook status and click “Get Offer.” They’ll then email you coupon for a free 1-month supply of GinZing Eye Cream. You can redeem the offer by printing the email or showing it on your phone. Coupon is valid through September 15th. To find your nearest Origins location, click here.